Overlooking the eastern shores of the Gulf of Thailand, the new Hard Rock Hotel Pattaya is a jewel in the heart of the city with its internationally famed image. It brings a unique style and first class entertainment to town! 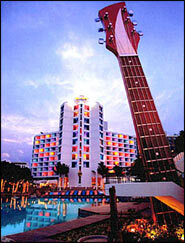 Asia's second Hard Rock Hotel is only an 8 minute walk along the Pattaya beachfront to the heart of Pattaya's entertainment and shopping area. Featuring 320 themed guest rooms and luxury suites decorated in a hip, vibrant style with in-room CD players, in-house entertainment system featuring blockbuster movies, satellite TV and non-stop music videos. 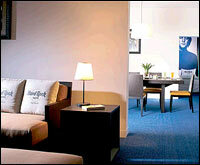 70 per cent of the rooms feature balconies with sea views. 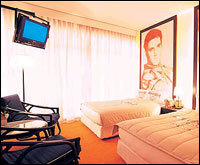 There are 320 themed guest rooms and luxury suites designed and decorated in a hip and vibrant style with oversized bed heads featuring famous rock 'n' roll personalities. With 70 per cent of the rooms overlooking the hotel's giant pool and facing the sea, you won't want to leave. 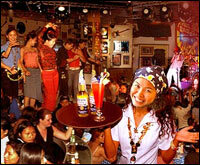 The original and the best in Bangkok for over 10 years, now brings rock 'n' roll culture to the eastern part of Thailand. Located beside the Hard Rock Hotel and opposite the beach, taking pride of place, HRC serves up burgers, fries, colas and rock in large portions. Flash your stage pass to walk right in. Open from 11.00 am till late for lunch, dinner and drinks. Live music from 10.00 pm onwards. And while you are there, take home a piece of Hard Rock history by visiting HRC's merchandise shop. Famed for its eclectic collection of rock 'n' roll memorabilia and contemporary show kitchen, Starz Diner is the Hotel's all day dining restaurant located on the ground floor. Inspired by the glamour that is Rock 'n' Roll, it provides a relaxing setting, with indoor and al fresco seating available, serving authentic Thai-Chinese, Japanese and Californian Italian cuisine. Open from 6.30 am until 12 midnight daily. Starz Diner is sure to tempt everyone. "New York, New York…" famous for its chic delis. Hard Rock Hotel Pattaya presents Starz Deli, showcasing the Hotel's freshly made cakes, pastries and breads, serving a variety of creative sandwiches, salads, hot savories as well as an array of ice creams and desserts. 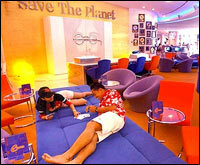 Located next to Starz Diner off the main lobby, it operates from 7.00 am to 9.00 pm. Starz Deli provides a casual setting with indoor and al fresco seating available and fast service for those looking for takeaway lunches or picnic baskets for the islands. You want high tech? Check out eBAR, located at the main lobby, providing high-speed Internet access and the latest network computer games. Its stylish avant-garde décor and diverse memorabilia portray a new look in Hard Rock. Open from 8.00 am to 1.00 am, eBAR will provide a place for guests to check emails, use the Internet, enjoy the most up to date computer games, or just relax while enjoying a drink. Network computer game challenges will be the order of the day, whilst in the evening it will be a meeting place for pre-dinner cocktails or nightcap after dinner. Feeling hot? Swim up and cool down at the pool bar. The Shack located near the sand pool will be the place where sun drenched guests can hang out for a long cool Tropical Cocktail or a Cold Beer, while relaxing in a jungle landscape. Get ready to Rock Around the Clock as we "shake, rattle and roll" all night long. Check out the menu in the directory and let our Room Service crew serve you some of the hippest food on the planet. Located by the poolside and close to the rejuvenating influence of the sea, the Hard Rock Spa & Health Club offers a harmonic symphony of relaxation and treatments for body and soul. This purpose built center offers 5 stylish spa treatment rooms on the 3rd floor, Thai Traditional Massage, hair salon, foot reflexology & Gym on the 2nd floor with a movement room, Steam, Sauna & Plunge pool on the ground floor. Featuring a 2,000 sq. meter pool with its own man-made sandy beach. 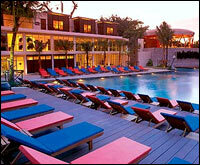 Relax around the poolside on one of the orange or blue sun lounges or rent a poolside cabana for the day. Let our Beach Club Crew entertain you with games and prizes or just take in the action from your sun lounge. Feeling adventurous or just want to have fun? Try your skill on Hard "Rock's Climbing" wall. This custom built climbing wall next to the pool will test your stamina. 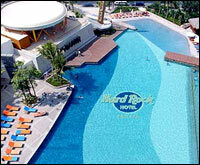 Hard Rock Hotel offers a variety of off site tours and activities to show case the diversity and charm of Thailand. A selection of tours are available for booking at the Hotel Tour Desk and return transport in the Hard Rock Hotel limousine is included in your entry price. Visit Nong tropical gardens, set on 520 acres and just 20 minutes from the Hotel, featuring 20 different gardens and shows. Watch the elephants perform, hold a monkey, have your photo taken with a tiger or try your skill on the go-kart track. Sriracha Tiger Zoo, only 30 minutes from Hard Rock Hotel, has become famous as the greatest Tiger Zoo in the world with hundreds of tigers, Elephant and crocodile shows and An Amazing Circus performance. Million Years Stone Park, just 15 minutes from Hard Rock Hotel, is more than just a fossil museum, with beautiful and curious things of all the three Kingdoms-animal, vegetable and mineral. Be fascinated by exotic plants, strange rock formations, rare animals and great shows.